2 down 1 to go – can we crown a new champion? The Belmont Stakes is the oldest of the Triple Crown races. This third and final leg is contested three weeks after the Preakness and five weeks after the Kentucky Derby. If the same horse has won both the Kentucky Derby and Preakness the Belmont Stakes becomes the biggest race of the year and Belmont Park becomes a madhouse on race day. Twenty three (23) times a horse has arrived with a chance at the Triple Crown but only eleven (11) times has a horse been able to wrap it all up in New York. The Belmont Stakes is the oldest of the three Triple Crown races. It was first run in 1867. White carnations are the official flower of the Belmont Stakes. They symbolize love and luck. The winning horse gets draped with a blanket made of 700 white carnations. We’re not really sure if this is a tradition yet but the Belmont Jewel is now the official drink of the Belmont Stakes. 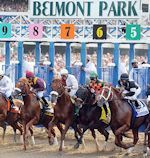 In 2012 the Belmont Jewel took over the title from the Belmont Breeze which took over the title from the White Carnation in 1998. The Belmont Jewel is a simple concoction… 1.5 oz Woodford Reserve Kentucky Bourbon, 2 oz lemonade, and 1 oz pomegranate juice. Shake vigorously with ice and serve on the rocks. Garnish with maraschino cherry or lemon twist. Here are the most recent winners of The Belmont Stakes. See the full list of Belmont Winners.